DeMar DeRozan got some measure of revenge on Thursday. 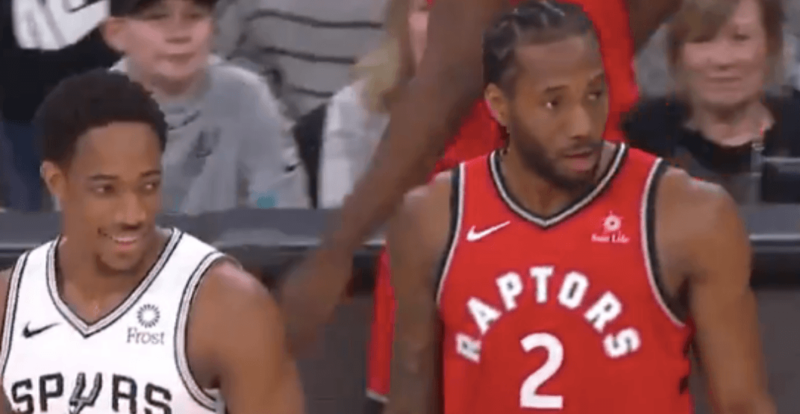 In the first meeting between the San Antonio Spurs and Toronto Raptors since last summer’s blockbuster trade, Kawhi Leonard’s team was blown out of the building with a 125-107 loss. DeMar DeRozan recorded the first triple-double of his career with 21 points, 14 rebounds, and 11 assists against his old club. Leonard finished with 21 points and five assists, without much help from his teammates. The Spurs started the game strong, jumping out to a 15-5 lead after an emphatic dunk by DeRozan, prompting Nick Nurse to call a timeout. The Raptors struggled to find a rhythm all game, with Leonard dominating the ball in isolations for a majority of his possessions. They went 2-for-12 in the first half from three-point land, with only five attempts at the free-throw line. Toronto turned the ball over eight times in the first half, compared to just three for San Antonio. The second half was much of the same, with the Raptors coming out sluggish, missing tons of open looks along with a poor defensive effort. The Spurs never looked back, dominating the paint and shooting the lights out from the perimeter. The Raptors have not won in San Antonio since 2009. The crowd was hostile all evening with loud boos and jeers every time Kawhi touched the ball. They even had a “traitor” chant. Both All-Stars were upset with their former franchises after the deal went down in July: DeRozan was told by the Raptors’ brass he would not be traded, and Leonard was upset with the Spurs organization after a mis-diagnosis of a thigh injury that kept him out all but nine games last year. The Raptors and Spurs meet for one final time this year on February 22.